Here’s a continuation of our radiator repair testimony. We did not have any problems with our car heating up on the way home from Manila yesterday, although I needed to add water/coolant once. Since we have another long trip coming up tomorrow morning, I wanted to make sure our radiator problems were adequately taken care of. 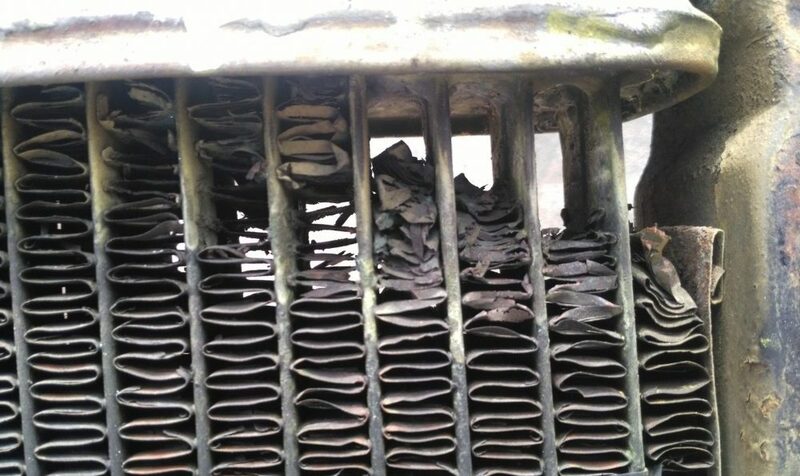 When I took it to the radiator shop yesterday, I found that our radiator was definitely beyond repair. There was a section of it that was even missing. There was a hole in part of it! (See actual picture of it above). I shared a special praise testimony about how the Lord helped us in both services today! People were amazed! I took the radiator in hand and showed it to the congregation as an illustration before giving it to the recycle man who attended, as he walked by at the end. What a blessing not to get stalled out in Manila traffic, and to be able to get back home safely! (It was probably at least around 7-8 hours of driving with a bad radiator like that!) God definitely answered prayer! Wow, how cool! 🙂 and you were even able to drive with it for 8 hours in Manila traffic!! lol.